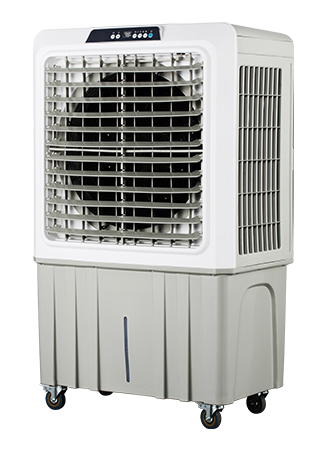 Evaporative air cooler, popularly known as swamp cooler, is definitely the most preferred cooling systems. This is thanks to their lower energy consumption, high cooling efficiency, environmental friendly nature, and reasonable cost. However, unknown to many people, this appliances comes with some symbols or tricks that make them produce more effective cooling. 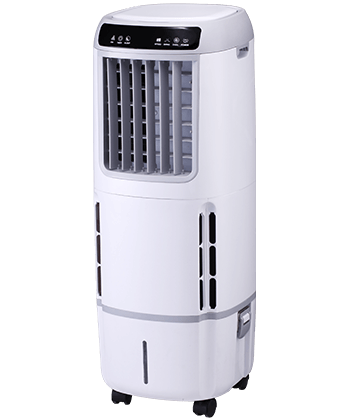 In this article, we will discuss about something you may not know about evaporative cooler. Evaporative cooling is arguably the oldest forms of climate control. Even before refrigeration was invented, evaporative cooling was already being used. This was seen through porous earthenware vessels that would be utilized to cool down water through it’s walls using the simple and natural evaporation process. Also, about 2500 BC, frescoes confirm slaves fanning jars of water in rooms to cool them. This is why evaporative cooler has been in existence even more than air conditioner. While the concept of evaporating cooling has been around for a long time, the root of Air conditioning dates back to the second century China. During this time is when an inventor known as Ding Huane designed a rotary fan that was manually powered. The concept of air cooling was also used by Benjamin Franklin, an American inventor and statesman, to conduct several experiments involving evaporation and alcohol while trying to attain freezing temperatures. However, the first modern air conditioner was designed by Willis Haviland Carrier in 1902. Mass production of evaporative coolers began around the year 1939. 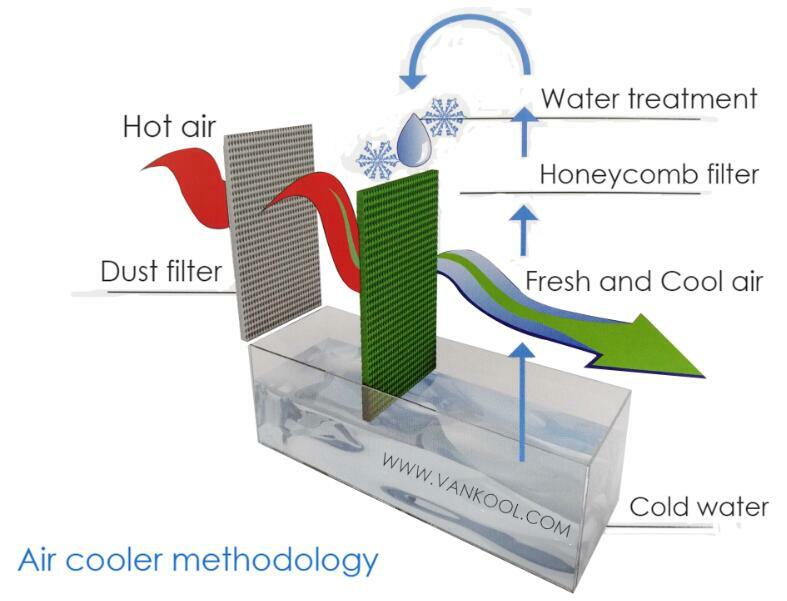 Evaporative air cooler operates through the principle of evaporation. 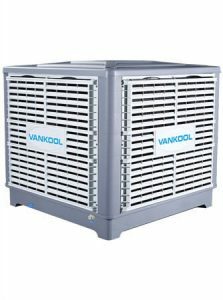 For instance, an evaporative cooler like Vankool uses a pump to convey water from water storage to the cooling pads which absorbs water. When the fan is running, it draws dry and hot airs from the outside though the water-soaked pads. As air moves through the pads, heat is absorbed through the process of evaporation thus cooling the air. It is important to ensure that the pads are well saturated and the cooling system is customized to deliver the right airflow to your home. The warm air goes through corrugated honeycomb filter and contacts with hydrone wet film. By this , parts of water hydrone absorb warm air and realize heat exchange. 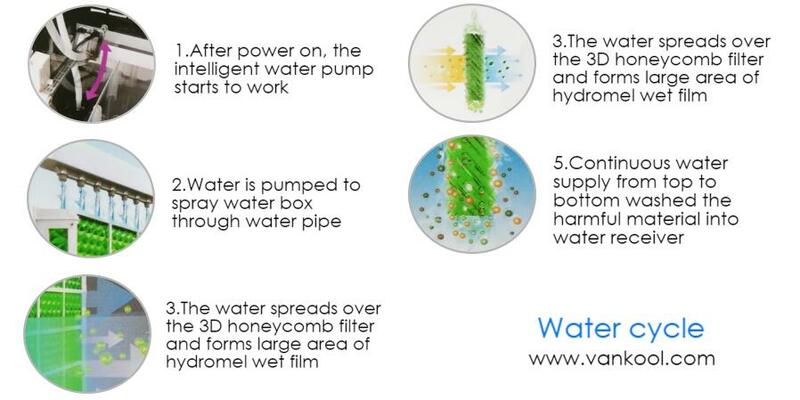 By “ honeycomb filter”, the exchange between air and water is finished. 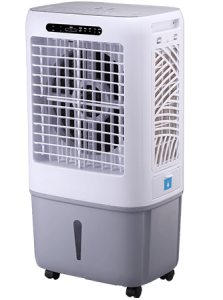 The air cooler realizes three core functions of air cleaning, cooling and humidifying. When the warm air flows through the honeycomb filter with over 100 times of exchange area, the heat is absorbed by water and cooled down. 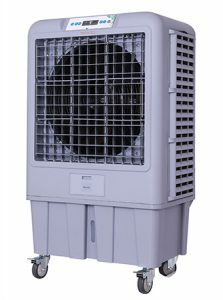 Single air cooler can provide cool wind 3-8.C lower than environment. Compared with traditional AC, the air cooler can be placed in open area with fresh air, meantime it can cool down air by natural water evaporation, which is low cost, low energy consumption and high efficiency. Also, the operation cost is 10% lower than AC and its EER can reach 13.3, much higher than AC. – Small size, portable, strong wind delivery. 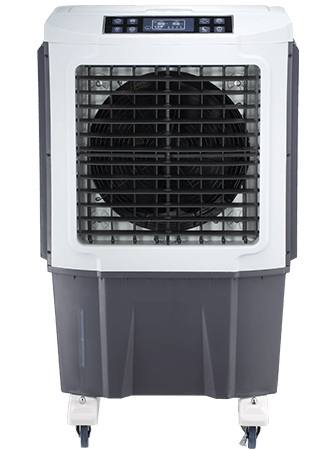 Evaporative air cooler cools the air by integrating the simple natural process of evaporation with a modern and advanced air moving system. In this process, fresh air coming outside the evaporative cooler is drawn into the cooler through moistened pads. The air is then filtered through a saturated evaporation and the result is humid air which is then circulated by a blower. These days, most unit’s come in the form of a simple box-life. The cooler’s pads are saturated by pumping water from the bottom to the top part of the unit and allowing it to flow down all over the pads. Air is then pulled through the pads using a powerful blower resulting to evaporation and the resulting cooler air is blown out at a very high speed. 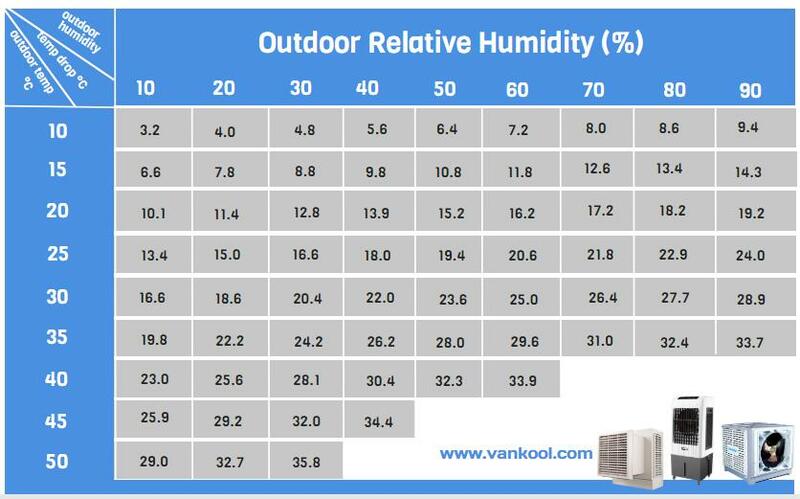 Humidity really matters when it comes to the efficiency of evaporative coolers. This is because swamp coolers cool the air by filtering it through water and lowering its temperature. The fresh air that is coming from outside gets filtered through a saturated evaporation. This results to a humid air that is then circulated by a blower. The production of humid air results from the absorption of some water during the cooling process. Therefore, we can see that swamp coolers will only work best when only small amount of warm dry air circulates into your home while the system is on. Therefore, the lower the humidity levels, the better the results when using an evaporative cooling. In turn, the higher the humidity levels, the less effective the results of evaporation as a cooling method. In summer hot and humid area, evaporative air cooler is mainly applicable to factory of textile, clothing, printing an dyeing, tanning, footwear, plastic, machinery, electronics, toys, food, chemical industry, metallurgy industry, personnel intensive or high temperature heat source place, trading market hall, station waiting room, hospital outpatient service hall and other commercial establishments are also used. In summer hot and dry area, in addition to apply to most plant ventilation cooling, can also used in shopping malls, supermarkets, farmers markets, restaurants, cafes, bars, entertainment, sports fitness room, conference room, hall, school, playground, family house. Portable swamp coolers are designed for the home because of their portable nature. Most of them comes with wheels thus you can easily roll them into your leaving room or bedroom. Industrial evaporative air coolers are designed to provide large scale cooling and are ideal for large indoor spaces, factories, and warehouses. These coolers use circulation and evaporation to keep large spaces cool. The material of outer frame is engineering plastics with anti-causticity and insulation, which can prevent the ultraviolet radiation, proved with excellent ageing resistance and longtime life. In terms of motors, for a cooler to work well it need to have 100 percent copper wiring. Although the less costly brands tend to replace copper with aluminum, the quality is very much reduced. Motor with full protection from over-voltage and overload, equipping anti-vibration bracket can make it High efficiency, low noise. Used to check the water level precisely. To control the whole units under the instruction. Aspen pads need to be replaced every year. Aspen pads lose efficiency with time because of the buildup of water and minerals absorbed. •Aspen pads tend to give off an aspen woodsy odor through the vents. Aspen pads are only an option for three panel coolers. Blue synthetic pads do not absorb and hold water efficiently like aspen pads. Blue synthetic pads need replacement every year. Cellulose pads are more durable thus do not deteriorate. Cellulose pads won’t have to be replaces every year. Cellulose pads have a burning smell which dissolves after running the cooler for some time. Water distribution can distribute water more uniform. Use the nylon as material which is durable and anti-corrosive. Integrated plastic fan blade more stable operation, it is more stable during operation, low vibration, noise dropped by 3dB(A). It stable water pressure, temperature rise is low, and is no burn without water. 9. How many air coolers are required for your place? Evaporative air coolers are rated according to the amount of air-flow that they can generate. This is why they are actually grouped according to air flow per minute. 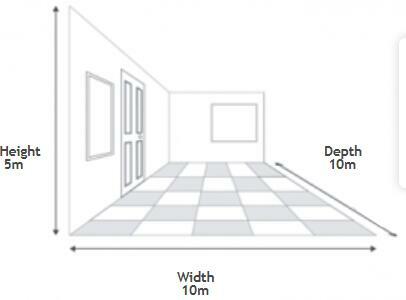 The total quantity of air that a cooler unit can pump per unit time can be measured in either CFM (Cubic Feet Per Metre), CMM (Cubic Metres Per Minute), or CMH (Cubic Metres Per Hour). The key to choosing your ideal evaporative cooler is choosing one with the right rating for your space. 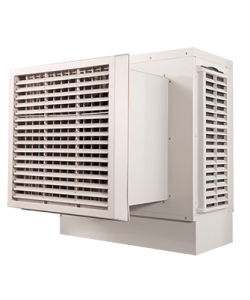 Therefore, you need to first calculate the CMH(m3/h) requirement of your cooler if you are seeking to know the right number of coolers to buy for your space. 1.some important reference data on air exchange rate in different situation. Air exchange rate is 20-30 times per hour for general environment. Air exchange rate is 40-50 times per hour for workshop with heating product equipments. Air exchange rate is 50-60 times per hour for workshop with temperature with serious polluted air. Remarks: air exchange rate can be in increased depends on outside temperature and humidity. Generally if humidity and temperature are high, air should be increased, in dry place air exchange rate can be decreased. 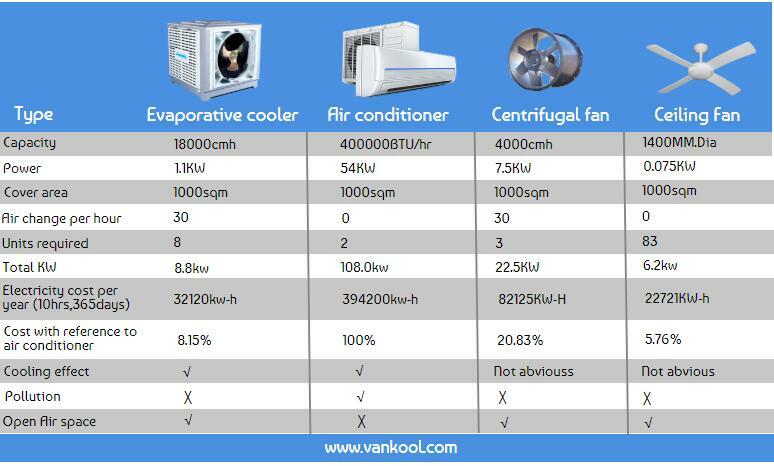 Numbers of cooler = Square meter area x ceiling height (M) x air exchange rate/ actual air flow volume of units(CMH). 3. 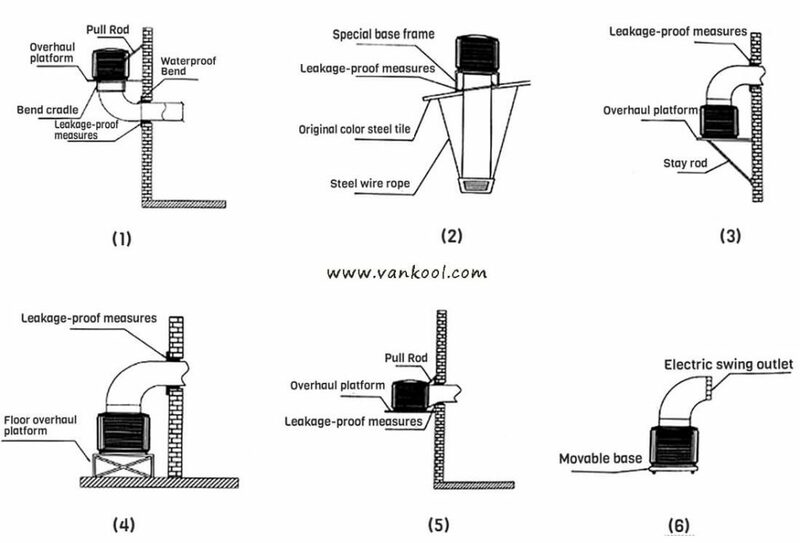 Air flow volume of each model. please refer to air volume-wind pressure graph from the manufacturer. Then, You will choose a air cooler with a 12,500 CMH rating. One shoes factory in China, with employee about 2000 and area 7000m2: the height of building is 3.5 meters, highest temperature is about 40degrees in summer. The process of production produces polluted air, such as benzene, hexane, and thinner, if workers work under this kind of conditions for long time, occupational diseases and poisoning will occur, For the existing severe environment, Labor and Social Security Administration Department ordered this factory to stop production and make correction and fined. The existing fans in the factory can not improve air quality and oxygen content, Once the management of factory assumed to install traditional air conditioning, according to the calculation, power consumption cost of 12 working hours for air conditioner will be 4608RMB, so they cancel this plan for the high cost and difficulties to solve the inside hygiene problem.. According to actual situation of the shoes manufacture, we installed 80 units evaporative air cooler with airflow of 18,000 m³/h, and the total airflow is 1440,000 m³/h. The hanging height of air outlet is 2.5M high. Times of ventilation of the workshop are 50 times per hour. The wind speed is about 5M/S. After installing air cooler units, the factory improves not only air quality and working conditions, but also total working efficiency. Primary investment The construction cost of installing compression air-conditioning system is RMB 1400000 while the cost of installing 80 units of evaporative air cooler RMB96,000, which save RMB440,000. The actual measurement data when running of evaporative air cooler units.